3… 2… 1… And launch! We're excited to announce a brand new promotional website for Christopher Nolan's sci-fi spectacular Interstellar, which has been playing in theaters for one month. The site allows fans to explore the entirety of the spacecraft Endurance, including the Ranger shuttles which they use for landing. 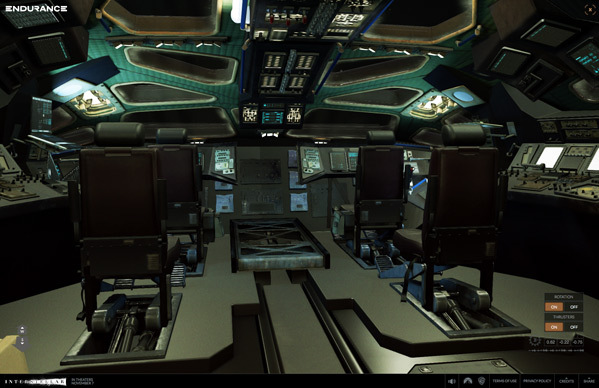 Built on WebGL, using the same 3D model from the Oculus Rift experience, you can explore an interactive interior of the Endurance. The ship was used by the exploration team, lead by Matthew McConaughey and Anne Hathaway, to travel to Saturn and ender the wormhole to visit another galaxy. While we've all seen inside the ship in the movie, this is the first place (aside from the game) to go this in-depth with Endurance. With our time on Earth coming to an end, a team of explorers undertakes the most important mission in human history: traveling beyond this galaxy to discover whether mankind has a future among the stars. Their spacecraft is called the Endurance. Now you have the opportunity to board the Endurance yourself in the Endurance WebGL experience―an immersive tour through a fully 3D model of this complex interstellar spacecraft. Uncover its secrets, find its hot spots and learn the functions of each component as you explore each module, with interactive photos, specifications and facts about this unique spacecraft built for the ultimate journey into the stars. 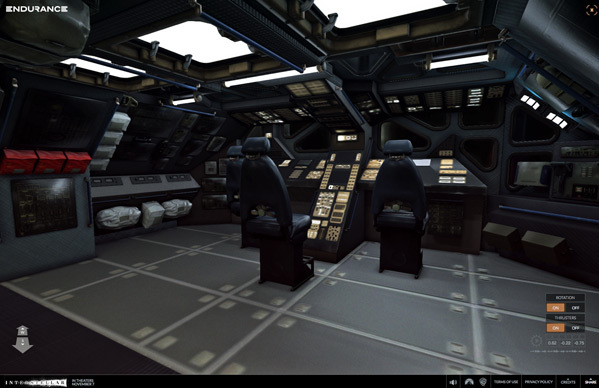 The Endurance WebGL experience has now been updated with interior models of the Ranger, the command module, the habitat module and the central docking hub. Click on any screenshot below to visit the new site and start exploring at: endurance.interstellarmovie.net. 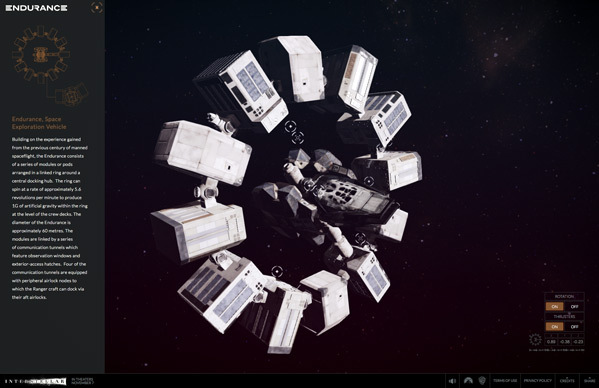 The Endurance WebGL experience is now available with interior models of the Ranger, the command module, the habitat module and the central docking hub. Start exploring inside the ship online here. You can even control the rotation and thrusters of the entire ship, along with your camera angle. Have fun. Love that little console that TARS and CASE fit into. So cool and clever. There are two types of circles. One of them is labeled as "Interior". Click on it and the interior will be loaded.